My family and I live in 790 sqft. That's my husband and I, our two kids, and for half of the week, my mum too. 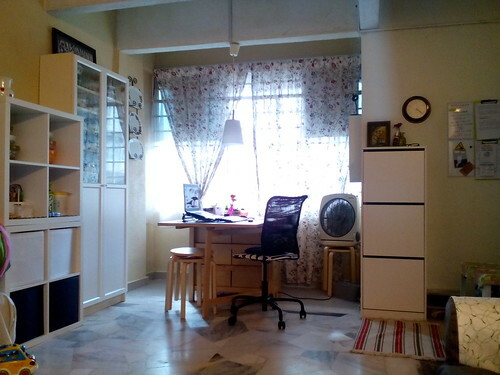 For me, personally, I love living in a small home. I think it makes us more creative and efficient in our use of space, and more conscious about what we need and bring into our lives. Today, I'd like to invite you into my living room, or our 'family' room as I like to call it, because this is where we spend most of our time. 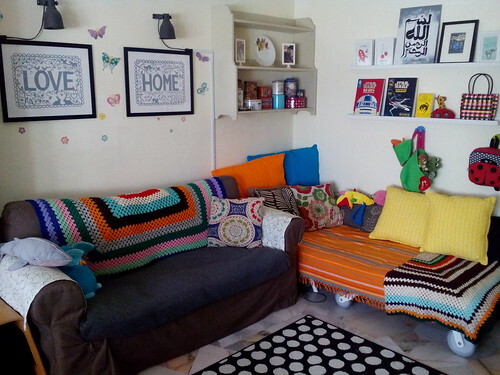 We do lots of things in this space, watching TV, reading, eating, playing and even sleeping! So welcome in! Here is our main entrance. There's no hallway or landing strip, so I've created one. To the left of the door is where we keep our shoes. 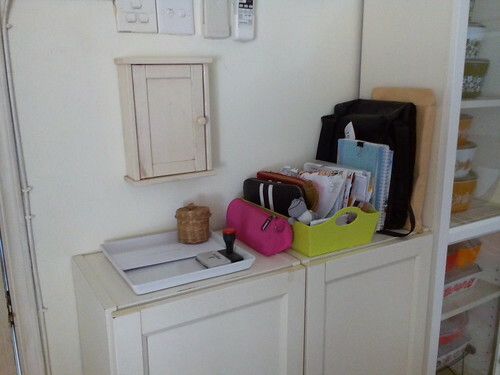 To the right is where we keep our keys, incoming mail and stationery. My son's tuition bag is also here, so he can grab it and go. When you live in a small space like I do, almost everything has to do double duty. I've put the space behind our door to good use by turning it into our command centre. It's here we keep important notes and reminders. 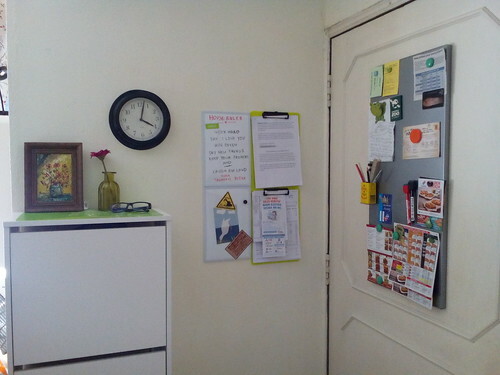 I've stuck some clip boards and magnetic boards on the wall with double-sided tape. 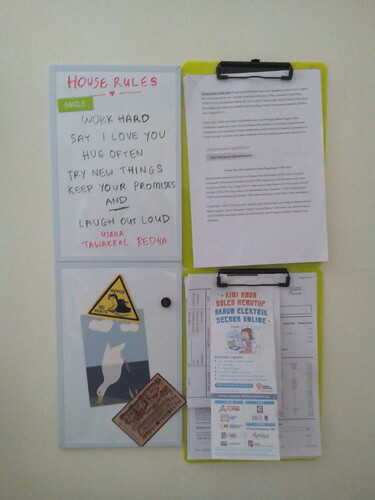 I got them from Daiso and use them to keep bills, notices and so on. 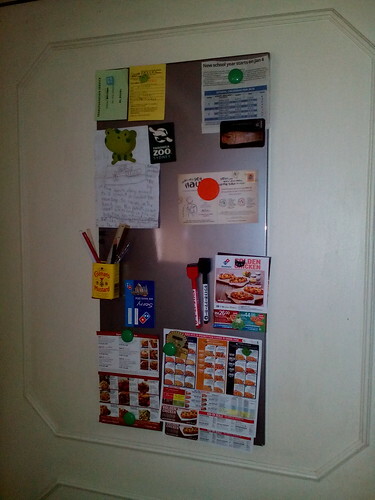 Meanwhile, this magnetic board from Ikea is useful for keeping school schedules and food delivery menus. 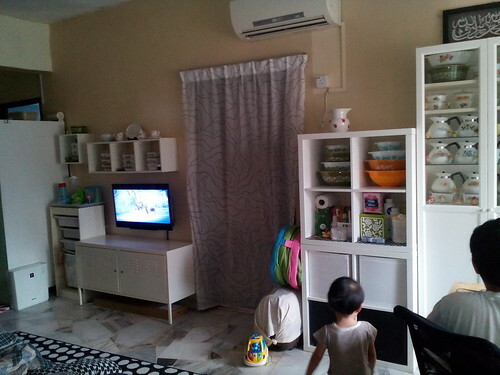 Now, here's a view of my family room from the entrance. As you can see, most of my furniture is from Ikea. I like the design and it's affordable. 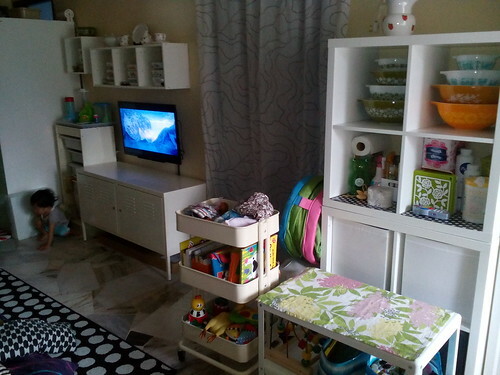 Besides being a more sustainable choice, Ikea furniture is also like a blank slate. They're modular and simple, so we can build around what we already have and it all goes together. The palette in this room is neutral. I like white walls and furniture, as it feels light and opens up the space. But I've introduced some black accents for contrast and bright colours to liven things up. 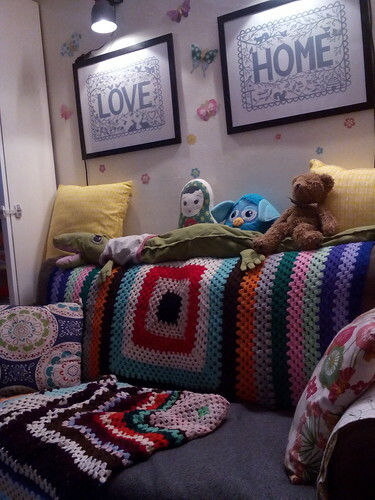 As you can see, we have a chair bed tucked into the corner. That's where I sleep on most nights! Opposite my sofa is our television and some storage shelves. I like movable furniture, like this coffee table on wheels and a toy trolley. We can easily push them around or out of the way. I also like that they're made of metal, so they're very durable and versatile. Here's a glimpse of what it would look like without the coffee table and trolley. 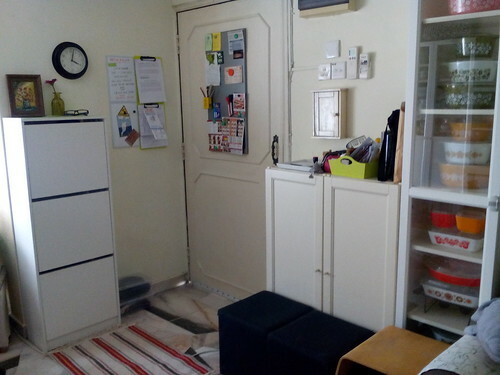 Underneath that aircon unit is the door to my bedroom.Ours is a two-room apartment with two bathrooms. Now on the other side of the room, we have a window. 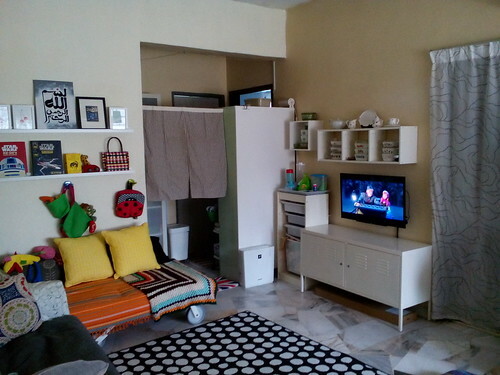 This used to be a tiny balcony, with a sliding door, but we did some renovating and reclaimed the floor space. This nook now houses my dining table, which also serves as my office and craft table. My son also does his home work and revisions on this table. Since this picture was taken, we've mounted a fan on the wall and did away with that ugly box fan! 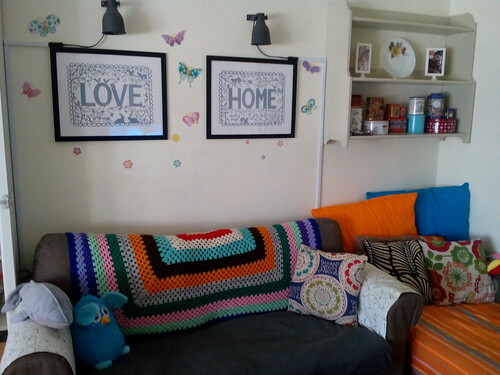 Well, that concludes the tour of my family room :) I'd love to show you other rooms in my home when I get the time. Hope you guys have a great day!